While most local acts are happy to get booked in a sweaty basement somewhere on the outskirts of Brooklyn, the local band Neckbeard Telecaster are lucky enough to be gearing up for quite the opposite experience. In fact, the band of bearded men who classify their music as "Psychedelic, Country and Glam," are set to take the stage this Friday on what will probably be a frigid January night to kick off the Seaport Music Winter Fest, and consequencely prove to all the benefit of the beard. Organized by the team who brought New York the Seaport Music Festival, the Seaport Music Winter Fest is pretty clear on their expectations, saying, "Only strong-bodied, dressed-in-layers, die-hard indie music fans need attend." Read: This is no Disney On Ice. The music starts at 7 p.m. and is 100 percent free to hear, but for those die-hards looking to skate/dance their way around the show should expect to pay a $5 admission fee and a $7 skate rental. It sounds like it's going to be worth that $5 though, as the bearded bunch are promising a "Calvacade of Stars on Ice," with special guests Grand Mal. But be forewarned, you indie die-hards, tight pants aren't the best option for sweeping C-cuts on an outdoor ice rink. I'm just sayin'. Seaport Ice is located on Pier 17 at The Seaport, and you can get there by taking the J, M, Z, 2, 3, 4, and 5 at Fulton Street or the A, C at Broadway-Nassau. 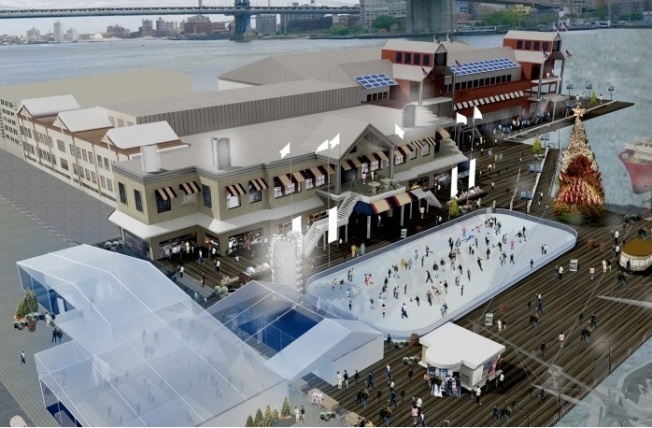 For more on the ice, visit The New Seaport's webpage.